Calum Butcher’s decisive seventh-minute header was enough to take Robbie Neilson’s promotion hopefuls to within eight points of County, with just eight games left in the battle to seal an automatic route to the Premiership. 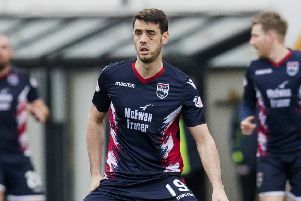 Victory represented a massive boost for Neilson’s men who will get another chance to put pressure on Stuart Kettlewell’s Highlanders when the two teams meet again in what promises to be another influential fixture at the start of next month in Dingwall. United knew this was a must-win fixture – victory for County would have put them 14 points clear – and they wasted no time in breaking the deadlock. From Peter Pawlett’s corner, midfielder Butcher lost his marker and cleverly glanced a header past County keeper Scott Fox from eight yards. 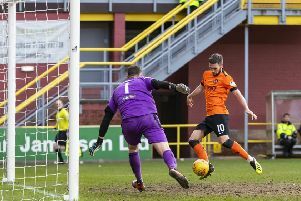 County were rocked by this early setback, but a reckless foul by Mark Connolly on Michael Gardyne almost brought an equaliser, with the former United favourite inches wide with his free-kick. In the 37th minute, County went close again when Ross Draper hit a low drive wide. The second half almost started with a bang for the visitors as Gardyne powered away from Connolly and presented Ross Stewart with a gilt-edged chance. The striker’s shot, however, was somehow cleared by the legs of United keeper Benjamin Siegrist. County threw on former United forward Brian Graham after the break, while Neilson, pictured, was also forced into a reshuffle, replacing injured Connolly with Algerian Rachid Bouhenna. United then had a shout for a penalty when Jamie Robson tumbled under a challenge by Marcus Fraser, but their claims were waved away. There were louder shouts for a spot-kick at the other end in the 70th minute as United’s defending became more desperate. Nicky Clark had the chance to kill the game in the 83rd minute when he was sent through by a brilliant pass from Paul McMullan. However, the striker elected to shoot rather than round Fox, who saved well. With United’s nerves jangling, Siegrist spilled the ball before it was booted clear on the line by Bouehnna and the Tangerines held out for a precious victory. County face Welsh outfit Connah’s Quay Nomads in the Irn-Bru Cup final in Inverness this weekend while United get the chance to close the gap further at the top of the table when they host Alloa.